The ribonuclease angiogenin is a component of the mammalian stress response that is secreted by renal epithelial cells on activation of the inositol–requiring enzyme 1α (IRE1α)–active spliced X–box binding protein 1 (sXBP1) axis and instrumental to the adaptation to AKI associated with endoplasmic reticulum stress. To determine whether the amount of angiogenin in urine of individuals with a kidney injury reflects the magnitude of the lesions and provides information on the risk of organ failure, we examined individuals referred for a kidney injury and determined the biochemical characteristics of urinary angiogenin and its diagnostic and prognostic values. Urinary angiogenin did not correlate with the urinary concentrations of high molecular weight proteins and correlated only weakly with low molecular weight proteins, suggestive of tubular production. In a cohort of 242 kidney transplant recipients with acute allograft dysfunction, higher urinary angiogenin concentrations at the time of the biopsy associated with worse renal function and higher proteinuria but did not correlate with histologic lesions as defined in the Banff classification. Kidney transplant recipients with urinary angiogenin amounts in the highest 50% had a risk of graft failure 3.59 times as high (95% confidence interval, 1.12 to 15.94) as that of patients with amounts in the lowest 50%. Finally, the amount of urinary angiogenin reflected the activity of the IRE1α-XBP1 axis in allografts. Our approach identified urinary angiogenin as a noninvasive indicator of the extent of tissue damage, independent of the histologic lesions, and a risk predictor of kidney allograft failure. Of particular interest in the UPR is the inositol–requiring enzyme 1α (IRE1α)–active spliced X–box binding protein 1 (sXBP1) axis. IRE1α is an endoribonuclease that catalyzes the unconventional processing of the mRNA encoding the transcriptional factor XBP1: a 26-nucleotide intron of xbp1 mRNA is spliced out by IRE1α, leading to a shift in the codon reading frame of the mRNA that generates a new COOH–terminal end. This translational frameshift creates a transcriptionally active XBP1 (sXBP1) that contains a potent transactivation domain and enters the nucleus.10 Genes that are regulated by sXBP1 enhance protein folding, transport, and degradation as well as the expansion of the protein secretory pathways. Beyond regulation of ER homeostasis and adaptation to ER stress, IRE1α senses danger signals and triggers numerous immune–related signaling pathways mediated by c-Jun N–terminal kinases, NF-κB, Retinoid Inducible Gene 1 receptors, or autophagy.11–13 In addition, sXBP1 is a critical component of immune responses mediating cancer, inflammatory disease, and autoimmunity, because it shapes the development and survival of numerous immune cells.14–18 Whether sXBP1 activity is specifically implicated in the pathophysiology of kidney disease is mostly unknown, but recent studies indicate that sXBP1 is required for podocytes and tubular cells maintenance on stressful conditions.6,19 We have recently shown that the ribonuclease angiogenin is integrated in the UPR and critical to renal adaptation to ER stress.7 More specifically, we have provided evidence that sXBP1 is necessary for the transcription of the gene encoding angiogenin and regulates its secretion by the renal epithelium, indicating that the amount of angiogenin in urine likely reflects sXBP1 activity in the kidney.20 To expand further our findings on the secretion of angiogenin on IRE1α-sXBP1 activation in the kidney, we undertook this study to characterize the biochemical aspects of the secretion of angiogenin in urine and evaluate whether this process is clinically relevant and provides information on the magnitude of the tissue damage in the course of AKI. To monitor the concentration of angiogenin in urine (reported for urinary creatinine levels to correct for dilution biases), we quantified angiogenin using the Quantikine Human Angiogenin Immunoassay (R&D Systems, Minneapolis, MN), and we first aimed at evaluating the technical performances of the dosage method. We found that the limit of detection was 65 pg/ml, that the limit of quantification was 1.7 ng/ml (Concise Methods), and that the higher urinary angiogenin concentrations that we observed in the study were within the range of linearity of the calibrating curve (Supplemental Figure 1A). Precision parameters (repeatability and reproducibility) were acceptable at low and high concentrations with low coefficients of variation (CVs) (Supplemental Table 1). Because the distribution of the values of urinary angiogenin/creatinine was skewed, we log transformed the values to obtain a Gaussian distribution (Supplemental Figure 1B). These results underscore the reliability of this method for the dosage of angiogenin in urine, and thoughout the paper, we refer to uANG as Ln(urinary angiogenin/creatinine). We next proceeded to characterize the specificity of uANG taking into account the other components of proteinuria, including the high molecular weight proteins albumin and transferrin and the low molecular weight proteins retinol binding protein, β2-microglobulin, and α1-microglobulin. We measured these parameters in a cohort of 192 individuals with CKD referred to the hospital for the evaluation of a kidney disease for whom a urine sample had been collected the same day (Supplemental Table 2). With these urinary dosages, we constructed a correlation matrix to evaluate how they relate to each other (Figure 1A). As expected, low molecular weight proteins were highly correlated together, and high molecular weight proteins were highly correlated together. uANG did not correlate with high molecular weight proteins and only weakly correlated with low molecular weight proteins. A multiple linear regression was performed to identify independent urinary proteins associated with uANG, which indicated that uANG was positively correlated with retinol binding protein and β2-microglobulin, a finding suggestive of a tubular origin of angiogenin production (Figure 1B). Importantly, these findings rule out the possibility of the presence of angiogenin in urine as a consequence of an increase in glomerular permeability. In addition, the fact that uANG is independent of total urinary proteins suggests that uANG is not a proxy for proteinuria but rather, reflects a regulated process that will likely provide informative values, independent of the other components of proteinuria. Finally, uANG levels are higher in patients with advanced CKD compared with in patients with normal renal function (Figure 1C), suggesting that kidney damage severity is associated with an increased production of angiogenin in urine. Biochemical characterization of uANG. 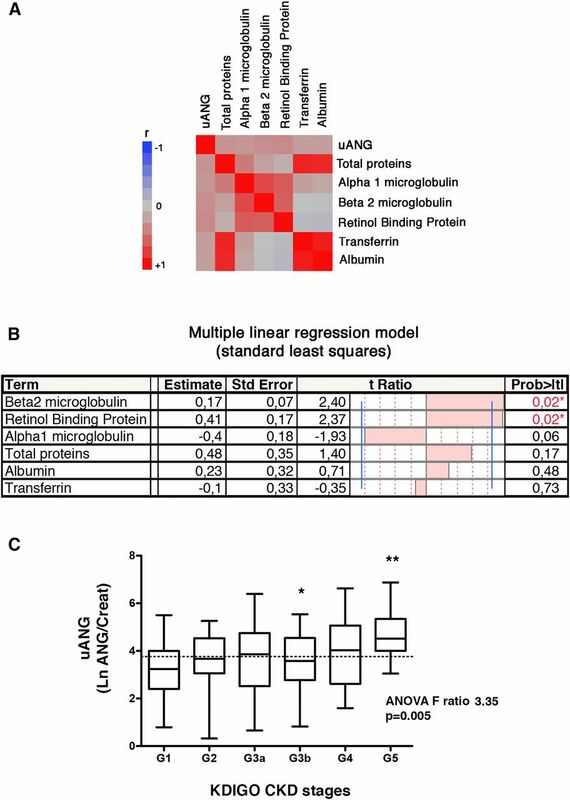 (A) Multivariate correlation matrix between uANG, proteinuria, albuminuria, urine transferrin, β2-microglobulin, α1-microglobulin, and retinol binding protein in a cohort of 192 individuals under investigation for CKD. All variables were reported by the value of urine creatinine. (B) Multiple linear regression analysis (standard least squares model) between uANG and proteinuria, albuminuria, urine transferrin, β2-microglobulin, α1-microglobulin, and urinary retinol binding protein as explanatory variables in the cohort of 192 individuals under investigation for CKD. All variables were reported to the value of urine creatinine. Estimate values give the estimate of the model coefficients for each term. The t ratio is the ratio of the estimate to its SEM, and it tests whether the true value of the parameter is zero. (C) Distribution of uANG (log transformation of uANG/creatinine) according to Kidney Disease Improving Global Outcomes (KDIGO) CKD stages (G1: eGFR>90 ml/min per 1.73 m2; G2: eGFR=60–90 ml/min per 1.73 m2; G3a: eGFR=45–59 ml/min per 1.73 m2; G3b: eGFR=30–44 ml/min per 1.73 m2; G4: eGFR=29–15 ml/min per 1.73 m2; and G5: eGFR<15 ml/min per 1.73 m2). *P<0.05 (G3b versus G5; Bonferroni multiple comparison test); **P<0.05 (G1 versus G5; Bonferroni multiple comparison test). Because angiogenin is a component of a cellular stress response that is produced by the renal epithelium on renal injury, we reasoned that the secreted amount could reflect the magnitude of the damage. To address this question, we took advantage of a prospective, observational cohort study that enrolled 247 kidney transplant recipients (KTRs) between February of 2011 and January of 2013 at the Necker Hospital for whom a urine sample had been collected the day of the clinically indicated biopsy (that is, for allograft dysfunction or proteinuria).21 Urine samples were not available for angiogenin measurement in five of them. The demographic and clinical characteristics of this cohort (242 KTRs) are shown in Table 1. We did not find significant or clinically relevant associations between uANG and recipients/donors clinical parameters (Supplemental Table 3). At the time of the biopsy (n=283; because some KTRs had repeat biopsies), which was performed at a median post–transplant period of 11 months (interquartile range, 1.3–55.2), the mean serum creatinine was 214±123 μmol/L, and the vast majority of the biopsies was performed owing to acute dysfunction of the renal allograft (82%). uANG levels were significantly higher in proteinuric individuals and those with high plasma creatinine concentrations (Table 2), indicating that the severity of tissue injury (as estimated by renal function and proteinuria) is positively correlated with the production of angiogenin in urine (Supplemental Figure 2). This suggests that uANG is related to the extent of tissue damage. Having shown that uANG might reflect the severity of tissue injury, we next made the assumption that uANG has informative value regarding the prognosis of kidney allograft on acute dysfunction. The Kaplan–Meier curves for graft survival stratified according to the levels of uANG at the time of an indication biopsy shown in Figure 2, A and B indicate that graft survival at 3 years postbiopsy was 95% for concomitant uANG in the lower 50% of lowest concentrations compared with 83% for individuals with uANG within the highest concentrations (P=0.002). Receiver operating characteristic analysis of uANG for graft failure postbiopsy generated an area under the receiver operating characteristic curve (AUC ROC) of 0.71 (P<0.001) (Figure 2C). Univariate Cox analysis of classic parameters associated with graft loss showed that recipient age, time interval between transplantation and biopsy, i+t score, donor-specific antibodies at biopsy, plasma creatinine, and proteinuria at biopsy were associated with graft loss (P<0.10) along with uANG, with a hazard ratio (HR) of 4.11 (95% confidence interval [95% CI], 1.65 to 14.43; P=0.002) for concomitant uANG in the higher 50% of concentrations (Table 3). A multivariate Cox model identified three factors that were independently associated with graft loss: time interval between transplantation and biopsy (HR, 1.15; 95% CI, 1.04 to 1.27; P<0.01), serum creatinine at biopsy (HR, 3.72; 95% CI, 1.27 to 13.72; P=0.01), and uANG (HR, 2.53; 95% CI, 1.5 to 4.28; P<0.001) (Table 3). 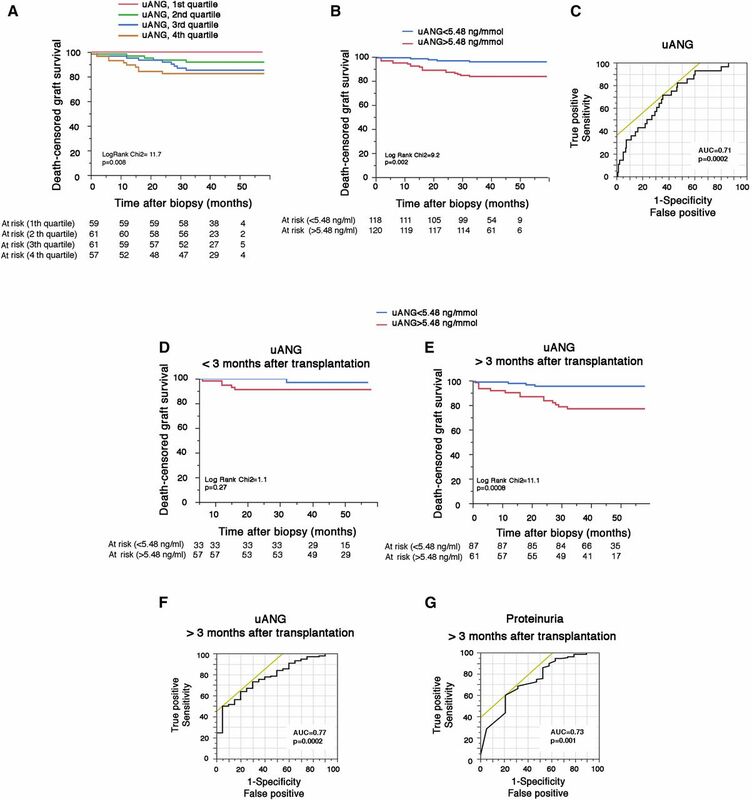 Sensitivity analyses indicate that, whereas uANG at the time of the biopsy measured during the first 3 months after transplantation was not associated with postbiopsy allograft survival (Figure 2D), it became strongly associated with graft loss when measured at least 3 months after transplantation (Figure 2E, Supplemental Table 4), and its predictive accuracy was increased (AUC ROC=0.77; P<0.001) (Figure 2F) and even outcompeted the predictive accuracy of proteinuria (AUC ROC=0.73; P=0.001) (Figure 2G). Together, these results indicate that KTRs with high uANG concentrations at the time of an acute renal dysfunction have a significant risk of failure and that uANG predicts graft loss with a good accuracy when measured at least 3 months after transplantation. uANG is predictive of kidney allograft failure. (A and B) Kaplan–Meier curves for the association between uANG and postbiopsy graft survival in the cohort of 242 KTRs who had a clinically indicated biopsy according to (A) quartiles or (B) the median of uANG. (C) Receiver operating characteristic curve for the association between uANG and postbiopsy graft failure. (D and E) Kaplan–Meier curves for the association between uANG and postbiopsy graft survival in the cohort of 242 KTRs at different time points after transplantation: (D) before 3 months and (E) after 3 months. (F) Receiver operating characteristic curve for the association between uANG and graft failure after biopsy performed >3 months post-transplantation. (G) Receiver operating characteristic curve for the association between proteinuria and graft failure after biopsy performed >3 months post-transplantation. Our observation that high uANG levels are associated with an increased risk of graft failure raises the important questions of the biologic consequence of the secretion of angiogenin in urine and whether angiogenin is associated with the failure of allografts in playing an active role or only an innocent bystander reflecting tissue injury. On the basis of the fact that ER stress can be transmissible to the neighboring cells through the secretion of soluble mediators,22,23 we considered that angiogenin could act as a paracrine mediator produced by renal epithelial cells under ER stress that would transmit ER stress to the microenvironment. To mimic the paracrine response to ER stress on neighboring nonstressed cells, we incubated human renal epithelial cells in culture with recombinant human angiogenin (rhANG) and monitored the activation of the UPR. rhANG activated the integrated stress response (ISR), an important component of heterologous preconditioning against various stress, including ischemia,24,25 as evidenced by an increased phosphorylation of eIF2α and the increased expression of the transcription factor Activating Transcription Factor 4 (Figure 3A). 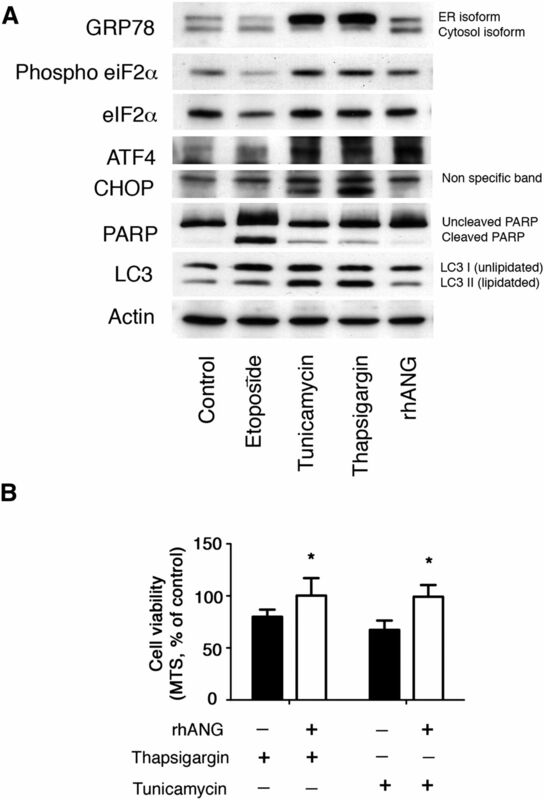 However, rhANG did not activate apoptosis, evidenced by the absence of expression of the apoptosis inducer CHOP and the absence of cleavage of PolyADP ribose polymerase, which during apoptosis, is cleaved by executioners’ caspases 3, 6, and 7 and serves as a marker of apoptosis.26 Moreover, rhANG did not induce the expression of the autophagosome marker LC3II, suggesting that autophagosomes do not accumulate in renal epithelial cells exposed to rhANG. Together, these results indicate that rhANG primes nonstressed HREC to activate the ISR without triggering full–blown ER stress response and apoptosis. This biologic effect is likely cytoprotective, because the viability of human renal epithelial cells on chemically induced ER stress is conserved when cells are coincubated with rhANG (Figure 3B). Together, these results indicate that angiogenin primes nonstressed renal epithelial cells to activate the ISR without triggering a complete ER stress response and apoptosis, thereby promoting cell preconditioning. Therefore, the prognostic value of uANG seems to be related to the magnitude of renal injury, and uANG is probably not instrumental in the process of kidney allograft damage. Angiogenin activates the ISR in nonstressed renal epithelial cells. (A) Immunoblot representing GRP78, phospho-eIF2α, eIF2α, Activating Transcription Factor 4 (ATF4), CHOP, PolyADP ribose polymerase (PARP), LC3, and actin expression at the protein level in human renal epithelial cells in culture after 24 hours of incubation with 2 μg/ml tunicamycin, 0.25 μM thapsigargin, 100 μg/ml etoposide, 1 μg/ml rhANG, or vehicle for 24 hours. Immunoblot is representative of three independent experiments. (B) Histograms representing the percentages of viable cells exposed for 24 hours to 2 μg/ml tunicamycin or 0.25 μM thapsigargin with or without 1 μg/ml rhANG compared with vehicle-treated cells. Cell viability has been assessed using the 3-(4,5-dimethylthiazol-2-yl)-5-(3-carboxymethoxyphenyl)-2-(4-sulfophenyl)-2H-tetrazolium (MTS) assay. *P<0.05 (t test; n=4). Having shown that uANG levels reflect the magnitude of tissue injury, we next asked whether urinary production reflects a specific etiology of renal injury at the time of the biopsy for cause. The fact that uANG predicts graft failure when measured 3 months after transplantation but not during the first 3 months raises the possibility of different processes that temporally regulate angiogenin production in urine. To test this, we examined the dynamic profile of uANG over time after transplantation and reasoned that the shape of the distribution curve can provide etiologic insights into how specific mediators of tissue injury fuel angiogenin production over time. Strikingly, the concentrations of angiogenin reached very high levels immediately after transplantation and declined during the first months after transplantation (Figure 4A), raising the possibility that the urinary production of angiogenin in the early post–transplantation period is related to I/R injury, which can transiently fuel angiogenin production in urine as a consequence of hypoxic stress in the kidney.27 In line with this, KTRs who experienced delayed graft function (defined as the need for at least one dialysis session during the first week after transplantation, reflecting the clinical consequence of I/R injury) and had a biopsy during the first 3 months had uANG amounts significantly higher compared with those who did not experience delayed graft function (Figure 4B). Consistently, KTRs who received a kidney from a living donor (in whom I/R injury is limited) have uANG amounts (when measured during the first 3 months) significantly lower compared with those with a deceased donor (in whom I/R lesions are more severe) (Supplemental Figure 3). Moreover, the severity of I/R injury (estimated by the number of dialysis sessions after transplantation) was also associated with high uANG levels, and this effect disappeared after 3 months (Figure 4C). Overall, these results support a model in which I/R injury fosters angiogenin production in urine during the early period after transplantation. In turn, the amount of uANG during the first 3 months after transplantation likely reflects the severity of I/R renal lesions but is not predictive of additional graft failure. Effect of a specific etiology of renal injury on uANG production. (A) Polynomial (quadratic) correlation curve between uANG and the period time between transplantation and uANG measurements over 10 years after transplantation in the cohort of 242 KTRs who had a clinically indicated biopsy. (B) Box and whiskers plots representing the distribution of uANG according to the occurrence of delayed graft function (need for at least one dialysis session during the first week after transplantation) and the period of time after transplantation during which uANG has been measured (before or after 3 months). ***P<0.001 (t test). (C) Linear correlation curve between uANG and the number of dialysis sessions required after transplantation according to the period of time after transplantation during which uANG has been measured (left panel, before 3 months; right panel, after 3 months). (D) Multivariate correlation matrix between uANG and individual histologic Banff scores in a cohort of 242 KTRs who had a clinically indicated biopsy. (E) Multiple linear regression analysis (standard least square model) between uANG and individual histologic Banff scores in a cohort of 242 KTRs having had a clinically indicated biopsy. Estimate values give the estimates of the model coefficients for each term. The t ratio is the ratio of the estimate to its SEM, and it tests whether the true value of the parameter is zero. We next assessed whether histologic lesions, as listed in the Banff classification,28 can provide clues to the etiology of angiogenin production. The correlation matrix made to evaluate how histologic lesions relate to uANG indicates that, as expected, the two tubulointerstitial inflammation scores (i.e., i and t), the two microcirculation inflammation scores (i.e., g and ptc), and the two chronic tubulointerstitial lesions scores (i.e., ci and ct) were strongly correlated to each other (Figure 4D), but they were weakly correlated with uANG. Because Banff elementary lesions are closely correlated, a multivariate linear regression was performed to identify independent Banff scores associated with uANG. We found that i scores (estimate =0.28; P=0.04) and ci scores (estimate =0.5; P=0.05) were positively associated with uANG (Figure 4E) and that ct scores were negatively associated with the amount of angiogenin in urine (estimate =−0.62; P=0.03). A possibility for this last result is that atrophic tubular cells have less tubular secretion capacity. The positive association of uANG levels with inflammation scores might reflect the activity of the IRE1α-sXBP1 axis of the UPR, which occurs in immune cells, including dendritic and B cells. Together, these results indicate that uANG, albeit associated with renal inflammation and chronic tubulointerstitial lesions, is not a good candidate for a noninvasive diagnostic marker of renal lesions, at least those defined by the Banff classification. However, the production of angiogenin in urine could be mediated, at least in part, by immune cells infiltrating the allograft. The fact that uANG at the time of a biopsy performed at least 3 months after transplantation for acute allograft dysfunction is a marker of the magnitude of tissue injury independent of the histologic lesions cataloged in the Banff classification and predictive of allograft loss suggests that the production of angiogenin by the injured kidney reflects a molecular reprograming process in response to cellular stress that arises beyond any histologic phenotype. Taking into account that angiogenin secretion is under the control of the transcription factor sXBP1,20 these results support the possibility that angiogenin secretion reflects sXBP1 activity in the injured kidney. In line with this assumption, the expression and secretion of angiogenin by tubular cells are concomitant to the expression of sXBP1 on ER stress (Figure 5A). Using an mAb that recognizes the spliced form of XBP1 and does not recognize the unspliced form of XBP1 (Concise Methods), we determined by immunohistochemistry analysis of injured allografts biopsies that sXBP1 is expressed (nuclear staining) in virtually all cell types present in the kidney, including epithelial cells, glomerular cells (podocytes, mesangial, and endothelial cells), and immune cells infiltrating the interstitium (Figure 5B), indicating that sXBP1 is highly expressed in injured kidney; however, the precise molecular and biologic mechanisms that support such an activity remain to be determined. Finally, the extent of sXBP1 staining is likely associated with the level of uANG, because in individuals with low uANG, the tubular expression of sXBP1 appears weak, whereas in individuals with higher uANG, the tubular expression of sXBP1 is more generalized (Figure 5C). uANG reflects sXBP1 activity in injured kidneys allografts. (A) Graph representing unspliced X–box binding protein 1 (uXBP1) and sXBP1 transcript relative expressions analyzed by quantitative RT-PCR and angiogenin secreted in the extracellular medium analyzed by ELISA (blue) by human renal epithelial cells incubated with 2.5 μg/ml tunicamycin or vehicle for various periods of time. Data are representative of three independent experiments. (B) Representative photomicrograph of sXBP1 expression evaluated by immunohistochemistry in kidney allografts from individuals with acute dysfunction. Original magnification, ×40. (C) Representative photomicrograph of sXBP1 expression evaluated by immunohistochemistry in kidney allografts from individuals with acute dysfunction and the corresponding uANG. Original magnification, ×40. There are many consequences of our findings. In a conceptual point of view, the detection at the molecular level of adaptive stress responses that occur in a tissue will support additional development of platforms of molecular monitoring, which will provide information on the nature of the stress and the type of response, provided that the marker is secreted. A step farther will be to delineate the secretome produced by stressed cells, independent of the membrane permeabilization associated with cell death, in response to a specific type of stress: for example, hypoxia, which could reflect Hypoxia Inducible Factor 1α activity; nutrients and energetic shortage, which could reflect Mechanistic Target of Rapamycin Complex 1 activity; amino acid shortage, which could reflect the General Control Nonderepressible 2 pathway; double-strand RNA, which activates the Protein Kinase RNA–activated pathway; TLR ligands, which can activate IRE1α, etc. Hence, a dynamic profile of activation of molecular checkpoints that sense microenvironmental stressors and transduce the message in a cell-extrinsic manner could be characterized and yield information on the tissue homeostasis perturbations beyond established tissue lesions. This process is in line with the concept of the molecular microscope actually developed in renal transplantation, with the advantage of a noninvasive approach. From a pathophysiologic point of view, our findings raise the apparent but yet uncovered role of sXBP1 in the pathophysiology of renal injury. Our data indicate that sXBP1 is highly expressed in injured allografts in both infiltrating immune cells and the nephron, including tubules and glomeruli. The mechanisms of activation and the biologic significance of the expression of sXBP1 in injured allografts are unknown, but there are few doubts that this process in biologically relevant. Indeed, sXBP1 is not expressed at the basal (unstressed) cellular level, and its activation is absolutely dependent on the activity of the stress–activated ribonuclease IRE1α. Other than its role in the adaptation to ER stress (in regulating genes involved in protein folding and degradation), sXBP1 is critical for numerous immune functions, which are IRE1α dependent but ER stress independent. For example, sXBP1 is a positive regulator, and TLR responses in macrophages (TLR2 and -4 engagement phosphorylates IRE1α14) are critical for B cells differentiation into plasma cells (a process that precedes massive Igs overload in the plasma cells30) and required for the development and survival of dendritic cells31 and CD8 T cells on acute infection.32 Therefore, it is tempting to speculate that sXBP1 reflects a complex process orchestrated by IRE1α activation, but according to the cell types, it is associated with ER stress (for example, tubular ischemia or oxidative stress) and/or reflects immune cells presence and activity. We can expect that, during the long–term follow-up, angiogenin is likely produced after the activation of sXBP1 as a consequence of smoldering immune (uANG levels are associated with interstitial inflammation scores) (Figure 4, D and E) and nonimmune insults associated with the activity of the IRE1α-sXBP1 axis and predictive graft failure. Whether angiogenin is protective or deleterious in this setting awaits investigation, but our findings (Figures 3 and 5) suggest that uANG amounts likely reflect the magnitude of tissue injury. In line with this observation, it is surprising to notice that sXBP1 transcripts have not been detected by the numerous transcriptomic screens of kidney allografts performed during the last decade. In conclusion, uANG levels reflect the severity of tissue damage on acute kidney allograft injury and are predictive of graft failure independent of histologic lesions when measured at least 3 months after transplantation. Because angiogenin expression is under the control of transcription factor sXBP1, our findings pave the way for additional determination of the role of the IRE1α-sXBP1 axis during kidney allograft injury. Between March of 2012 and March of 2013, 192 consecutive individuals who were referred to the Nephrology Department at the Georges Pompidou European Hospital for a kidney biopsy were evaluated for potential inclusion in the study. Indications for biopsy were eGFR<60 ml/min and/or proteinuria >0.5 g/L. Kidney biopsies were only for patient care. At the time of biopsy, urine samples were collected for routine clinical chemistry analyses and stored at −80°C. Detailed information regarding the clinical, medical, demographic, biologic, and histologic status of the patients was collected using an information–based data warehouse.40 Analyses were performed anonymously. Paris Descartes University Ethics Committee (Comité de Protection des Personnes/Patients Protection Comity) approved this observational study. Participants provided written consent, and the ethic committee approved this consent procedure. All KTRs at the Necker Hospital with indication biopsy and a corresponding urine specimen were prospectively included from February of 2011 to February of 2013. Midstream urine samples were obtained immediately before clinically indicated renal allograft biopsies and centrifuged at 1000×g for 10 minutes within 4 hours of collection. The supernatant was collected after centrifugation and stored with protease inhibitors at −80°C. This single-center study was approved by the Ethics Committee of Ile-de-France XI (13016), and all participating individuals provided written informed consent. Angiogenin was quantified using the Quantikine Human Angiogenin Immunoassay (R&D Systems) according to the manufacturer’s protocol. Angiogenin concentrations were corrected for urinary creatinine levels. Notably, similar results were found when not corrected for uANG. We evaluated the precision of the ELISA protocol for the dosage of angiogenin in urine following the French guidelines for methods validations (SH GTA 04; derived from the ISO 15189:2012, which specifies requirements for quality and competence in medical laboratories). Precision was quantified using a CV, which resulted from the following formula: CV (%)=(s/m)×100; s is the SD and m is the mean of five measurements of the same sample (either low or high concentration) on the same day by the same operator repeated on 3 different days. A CV<10% is considered acceptable. We evaluated the limit of detection as 3×sb; sb is the SD of 30 measurements of the absorbance of the baseline (blank), and the limit of quantification is 10×sb. Clinically indicated biopsy specimens were fixed in formalin, acetic acid, and alcohol and embedded in paraffin. Tissue sections were stained with hematoxylin and eosin, Masson trichrome, periodic acid–Schiff reagent, and Jones for light microscopy evaluation. Renal allograft biopsies were classified using the Banff 2013 update.28 In several analyses, mixed rejections were included in the antibody–mediated rejection category, because they required the same clinical management and therapeutic interventions as antibody-mediated rejection. Kidney biopsies were fixed in alcohol, formalin, and acetic acid, dehydrated with ethanol and xylene, embedded in paraffin, and cut into 3-μm sections. Samples were then deparaffinized, rehydrated, and heated for 20 minutes at 97°C in citrate buffer. Endogenous peroxidase was inactivated by incubation for 10 minutes at room temperature in 0.3% H2O2. Sections were incubated with PBS containing 1:100 anti-sXBP1 (clone 2G4–3E11–3E9). sXBP1 2G4–3E11–3E9 is a mouse mAb of IgG1 isotype produced by immunizing animals with a keyhole limpet hemocyanin–coupled synthetic peptide corresponding to residues localized in the C-terminal domain and purified from ascites by protein A chromatography. Next, sections were incubated with anti-mouse antibody conjugated with peroxidase-labeled polymer (Dako) visualized with a peroxidase kit (Dako). Finally, the tissue sections were counterstained with hematoxylin. Human renal epithelial cells were cultured in DMEM. Detailed methods are available in Supplemental Material. Total RNA was extracted using the RNeasy Mini Kit (Qiagen, Germantown, MD) according to the manufacturer’s protocol. Detailed methods are available in Supplemental Material. Detailed methods are available in Supplemental Material. Protein extraction and immunoblotting methods are available in Supplemental Material. Human renal epithelial cells (5000 cells per well) were plated in a 96-well plate. The relative number of live cells per well was determined on the basis of mitochondrial integrity by assay with 3-(4,5-dimethylthiazol-2-yl)-5-(3-carboxymethoxyphenyl)-2-(4-sulfophenyl)-2H-tetrazolium (Promega, Madison, WI) according to the manufacturer’s protocol. Continuous variables are presented as means and SDs, and categorical variables are as presented as proportions. For ANOVA of continuous variables in different groups, t test and one-way ANOVA were used, and Dunnett post–test correction test was performed to compare more than two groups and correct for the effect of multiple comparisons to a single control. Dichotomous variables were compared using the chi-squared test. Because the distribution of urinary angiogenin/creatinine was skewed toward high values, the values were log transformed (Supplemental Figure 1B). For assessing the biochemical and histologic determinants of uANG, a multivariate correlation matrix was generated followed by a multiple linear regression model (standard least squares). Among the 242 KTRs, we evaluated the rate of graft failure according to quartiles and median of Ln angiogenin using Kaplan–Meier curves, log rank test, and a Cox proportional hazards model with adjustment for the covariates associated with graft loss in univariate analysis with P value <0.10. In case of death with a functioning graft, we censored graft survival at the time of death. Receiver operating characteristic analysis was performed to evaluate diagnostic accuracy. Statistical analyses were performed using JMP.10 (SAS software; SAS Institute Inc., Cary, NC). All tests were two sided, and P values <0.05 were considered to indicate significance. This work was funded by grants from the Institut National de la Santé et de la Recherche Médicale and la Fédération Nationale pour l’Aide aux Insuffisants Rénaux et la Fondation du Rein. D.A. is supported by the Réseau Thématique de Recherche et de Soins Centaure and the Fonds Emmanuel Boussard. D.A. and N.P. contributed equally to this work. This article contains supplemental material online at http://jasn.asnjournals.org/lookup/suppl/doi:10.1681/ASN.2016020218/-/DCSupplemental.